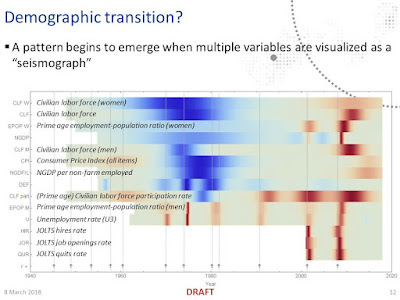 Nick Bunker's labor market analysis are the go-to for detailed, nuanced — and yet "mainstream" — views. By this I mean that if you're not all that into listening to crackpots, he's definitely a good way to go. 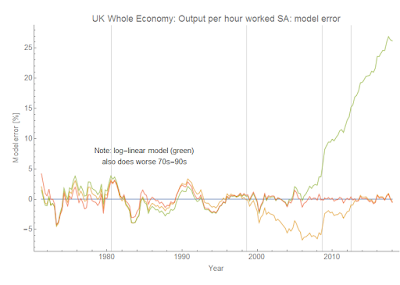 But then, I'm a crackpot with my own theory of how labor markets work (paper here). But only certain kinds of hiring are down. 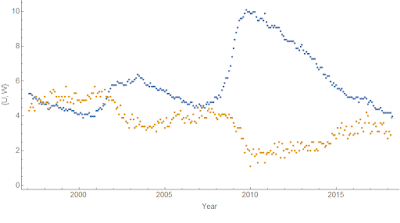 Hiring of workers who were previously unemployed or out of the labor market is in-line with the previous labor market recovery. The hiring that is down is the hiring of already-employed workers. 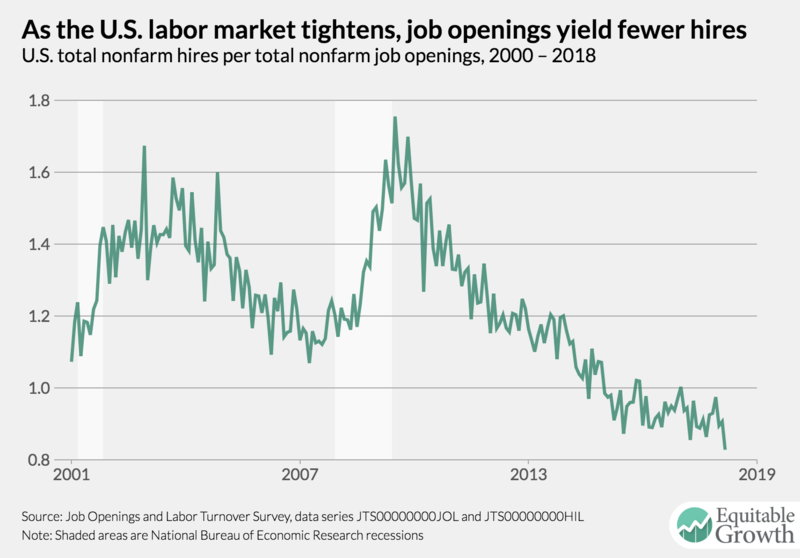 You could read this as a lower risk tolerance: fewer people with jobs out looking for new, better jobs — a kind of hunkering down against the uncertain future. 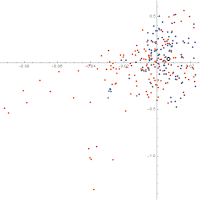 A similar sentiment may be measured in the conceptions data. Is wage growth falling because men get better raises than women, but are becoming less and less of the workforce? 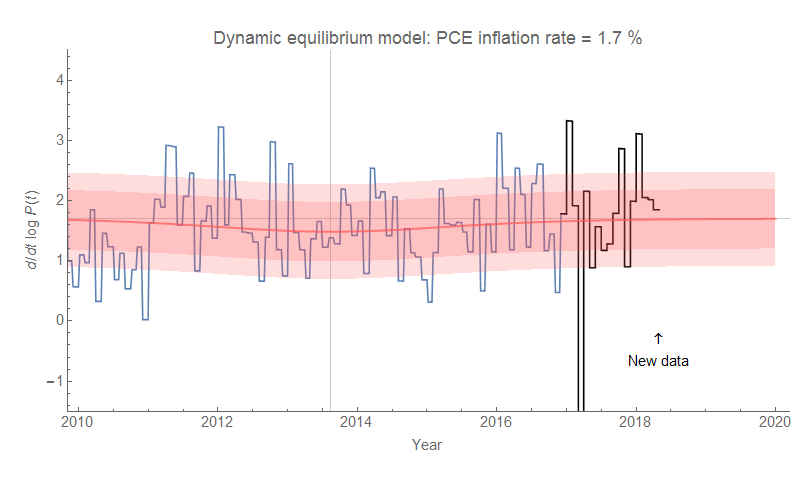 Noah Smith has called Japan the place where macro models go to die, and recently tweeted about high employment and low inflation creating a definite puzzle. 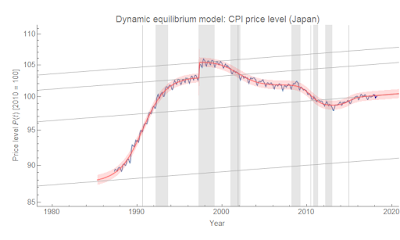 However, in the dynamic information equilibrium model, Japan seems mostly like a normal economy just will really low equilibrium inflation (0.1% per year). 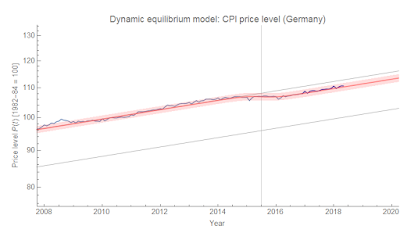 In the data below, I removed the effect of the VAT increase in 2014, but not the 1997 one (I actually modeled it as a shock to the price level). 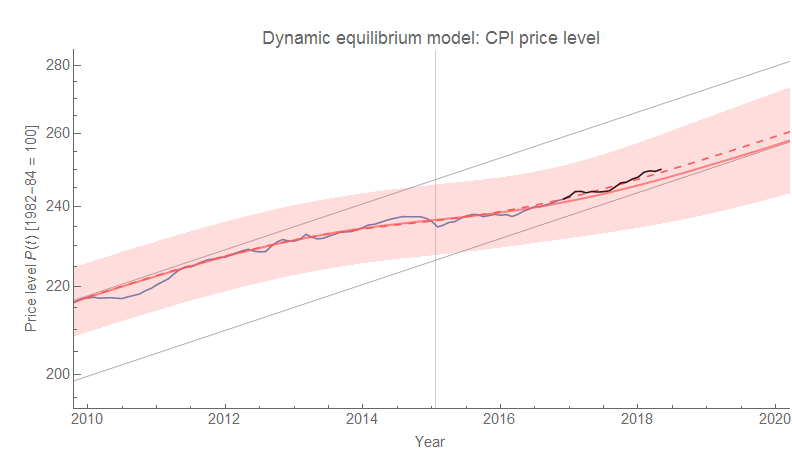 The reason I did this is that the 1997 shock comes roughly when the CPI is at equilibrium (0.1% inflation) after the previous transition is ending, while the 2014 comes right in the middle of a transition/shock that follows the Great Recession. 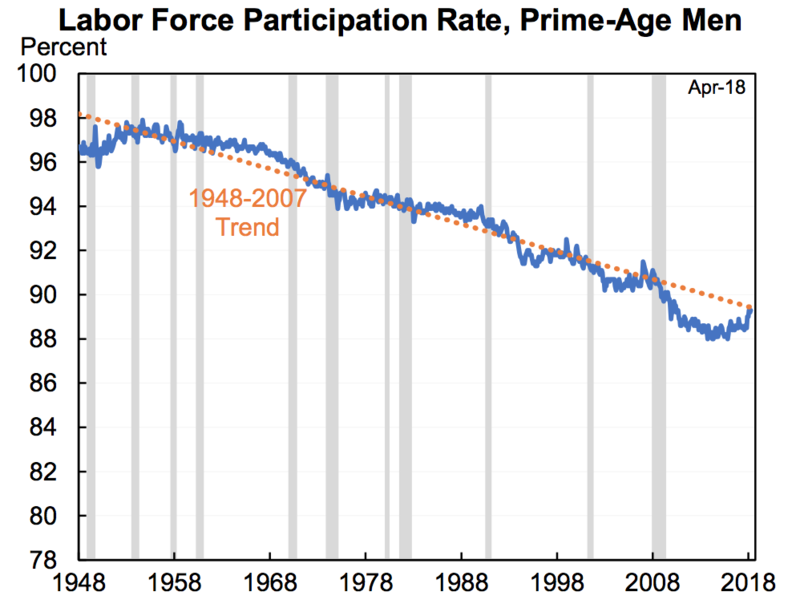 Also note that I switch randomly between references to the labor force, labor force participation, and the employment rate. 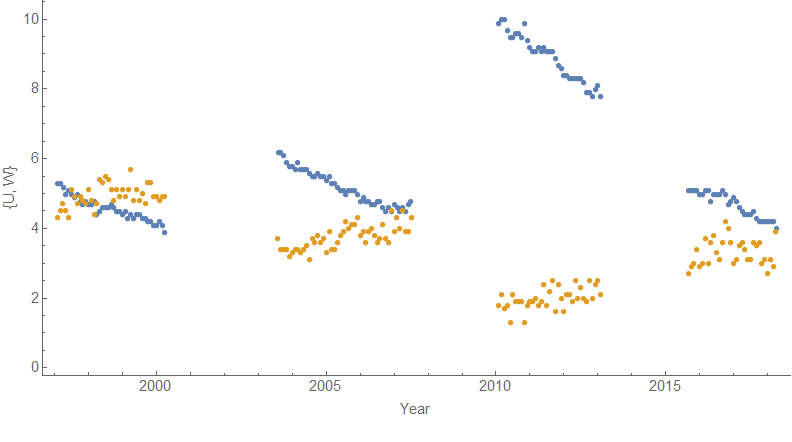 It should all be employment rate (per the data). 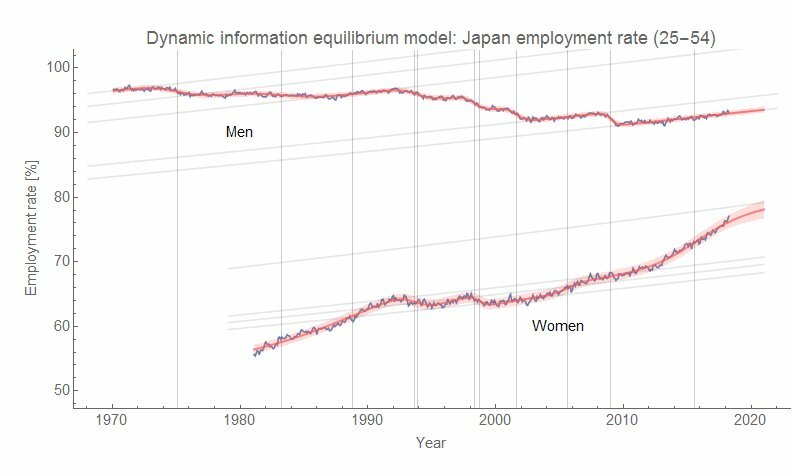 But as Japan's unemployment rate is low and fairly constant, there isn't a lot of difference between the basic structure of these different measures of employment. I therefore elected to write this paragraph instead of editing and correcting the references in this post. 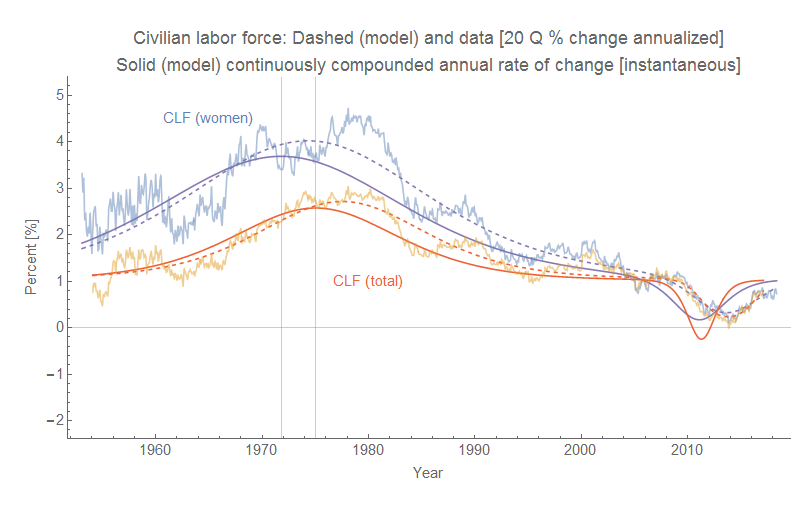 CPI surge follows the surge in women’s labor force participation in the 70s and 80s. 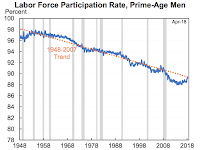 This increase in the employment rate is cut off by early 90s recession. 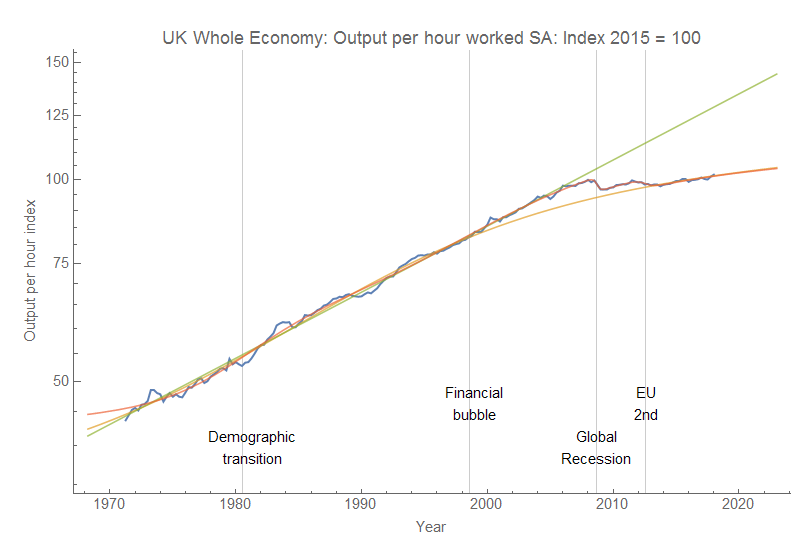 Early 1990s recession shows loss of employment for both men and women, and cuts off the inflation surge. 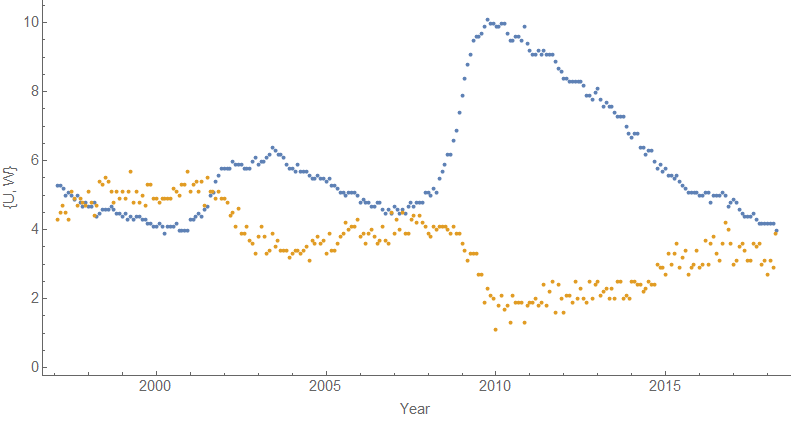 The 1997/8 Asian financial crisis negatively impacts employment (for both men and women), but not inflation (the 97 blip is due to VAT tax changes). 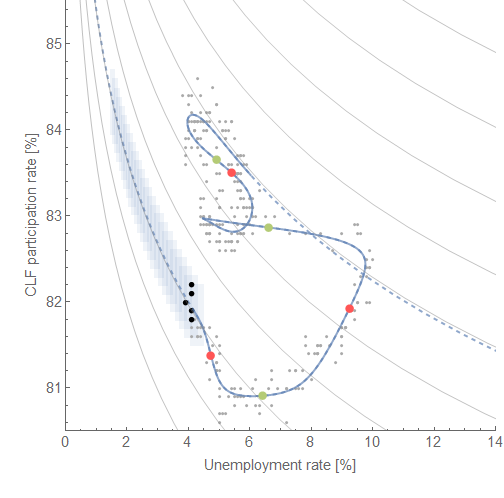 Early 2000s recession impacts both employment and inflation in a normal fashion. The Great Recession impacts inflation and men’s employment, but just cuts off the surge in women’s employment that began after the early 2000s recession. 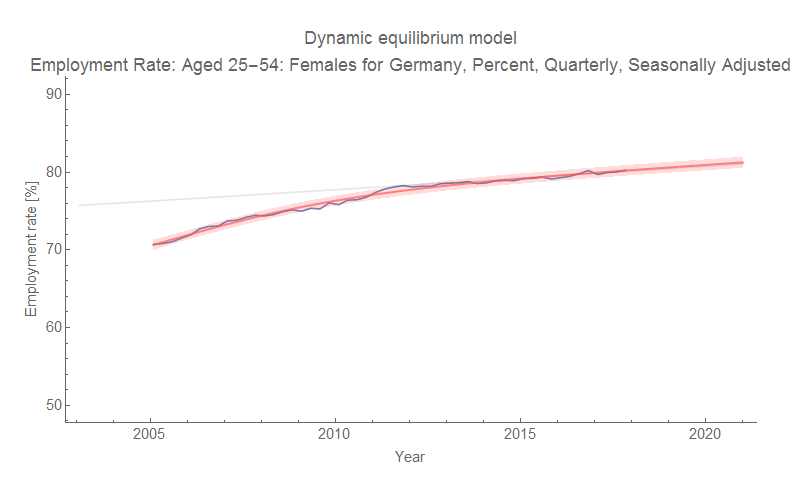 After the Great Recession, women’s employment rate begins to surge again (while men’s just grows at its equilibrium rate). The recent inflation "surge" (to just 1%) closely follows this rise. 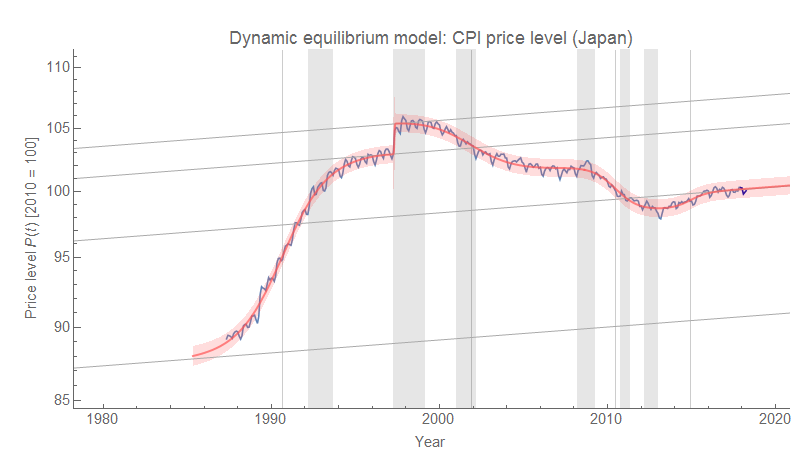 This is all to say Japan has a pretty normal relationship between employment and inflation in terms of dynamic equilibrium (i.e. 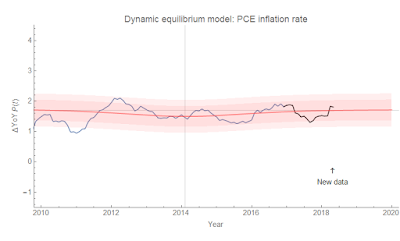 rates of change): when employment falls, so does inflation. 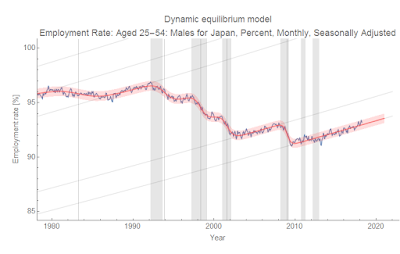 The overall employment rate increased from the 70s until the 90s (inflation was higher), fell though the 90s (Japan's "lost decade" where inflation fell), and began to increase again in the 2000s (with a pause at the Great Recession). 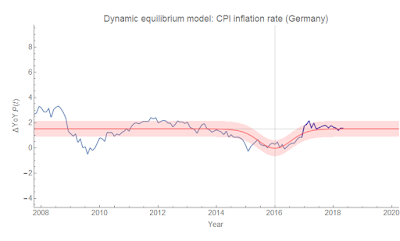 Inflation caught up a small amount, and it is possible it will continue to increase with the increasing size of the labor force (inflation lags labor force increases). 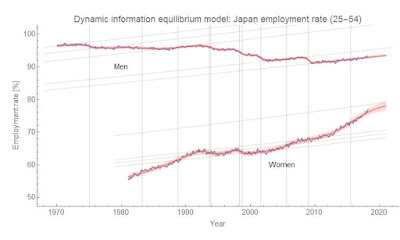 However, Japan does not have a normal relationship between unemployment and inflation in terms of numerical values. 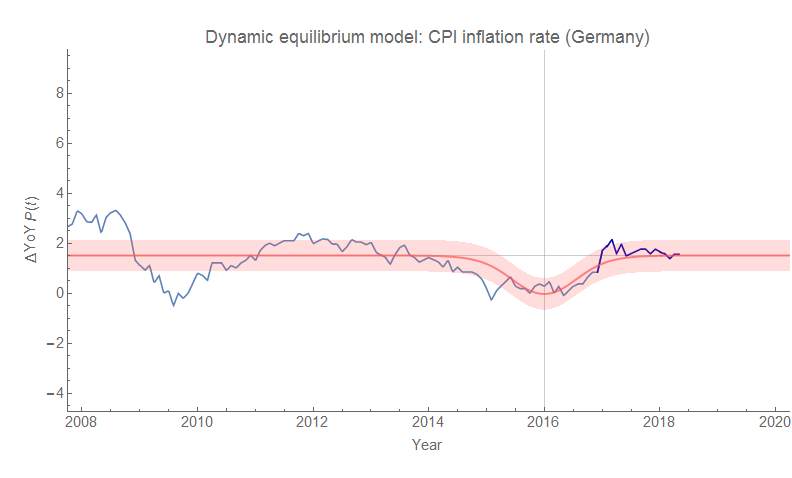 Equilibrium inflation is almost zero, so the labor force can increase at its equilibrium rate and inflation will be almost zero. A surge in the employment rate causes inflation to rise ... to 1%. 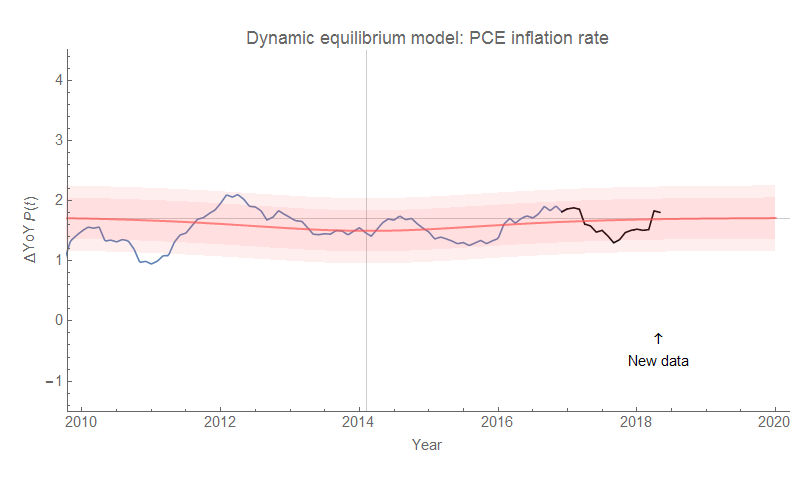 But that 1% is 1% above equilibrium; it would be analogous to US inflation rising to 2.7% (PCE), 3.5% (CPI), or 3.4% (DEF). That would be major news in macro! 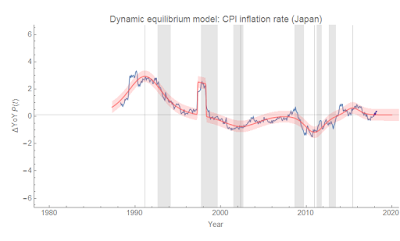 But since we expect Japan to have 2% inflation for some reason (I guess the BoJ said it wanted 2% inflation at one time), we see 1% inflation as a "failure" of monetary and/or fiscal policy . 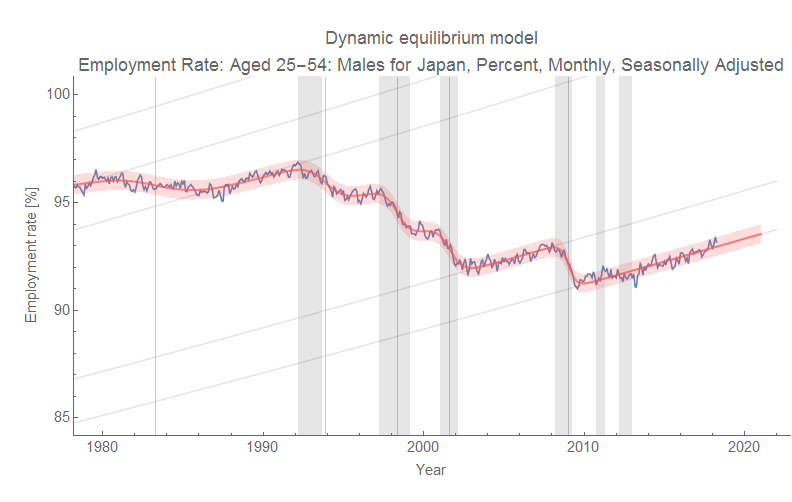 Japan seems to have low inflation because it has a very low employment rate dynamic equilibrium: it is about 1/3 the rate of the US (see graph below), so if US core inflation is 1.7%, we might expect Japan to have an equilibrium inflation rate of 0.6%. In that context, 0.1% isn't that far off from this back of the envelope estimate. This is probably directly related to low population growth. Australia, with its higher population growth, has a higher equilibrium inflation rate (deflator inflation of 2.8% compared to US of 2.4%). 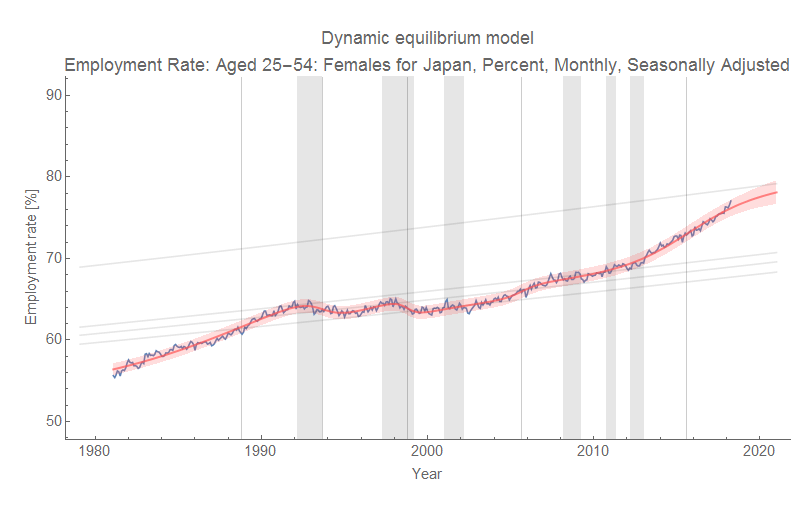 If "Abenomics" is responsible for the increase in women in the workforce, then Abenomics "worked". If we just think of Abenomics as fiscal and monetary policy, those appear to have done nothing. 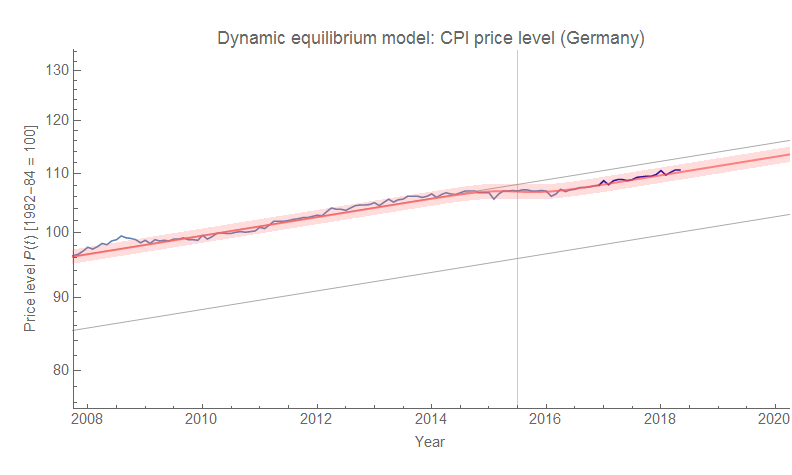 I fit the model for the CPI in Germany and came up with the same general story as most of the rest of the countries I've been looking at. 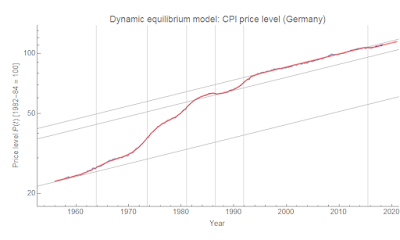 The only thing I don't really understand is a sudden drop in inflation (deflation) the mid-80s. 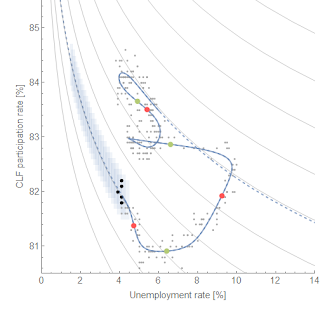 Otherwise most of the shocks are associated with recessions. Here is CPI, year-over-year inflation, as well as two zoomed-in graphs of the post Great Recession period. As always, click to embiggen. 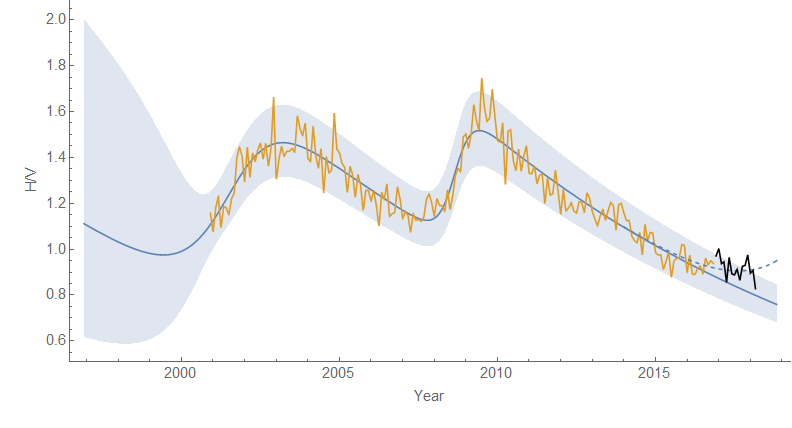 One thing to note is that I used the US model code which ignores data after the forecast date (used to compare the latest data with forecasts, and usually shown in black). However, I technically had all the data so this is really more of a reserved subset out-of-sample forecast than a genuine forecast. Therefore I changed the color to dark blue. 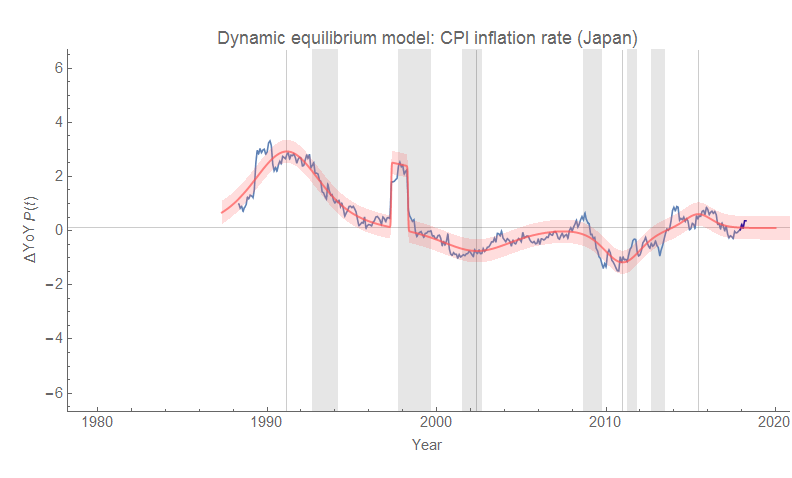 So instead, there will be another post on Japan and the relationship between the labor force and inflation. I will put up a "seismograph" version when I get a chance. 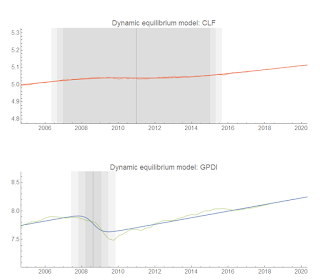 One modification I did make was to decrease the scale of the "Great Recession" shock in GPDI because it made the 70s expansion difficult to make out (low contrast). 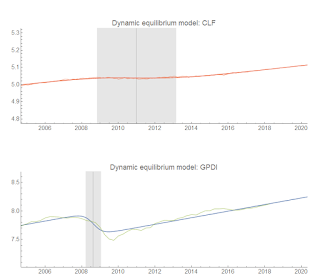 This should actually be telling; the size of the expansion in GPDI relative to its typical growth rate is small, making it one of the smallest shocks. The 10 year rate has increased its deviation from the model, but the S&P 500 is tracking the forecast fairly well despite heading towards a deviation in early 2018. 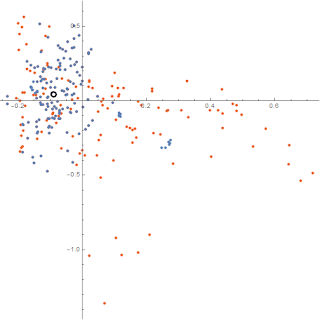 A center of 2019.8 produces a shock with amplitude parameter a₀ = 1.4 ± 0.6 and width parameter b₀ = 0.9 ± 0.2 year. That's somewhat wider and larger than the 2008 recession (a₀ = 0.84 ± 0.01 and b₀ = 0.37 ± 0.03 year), but largely consistent with it. 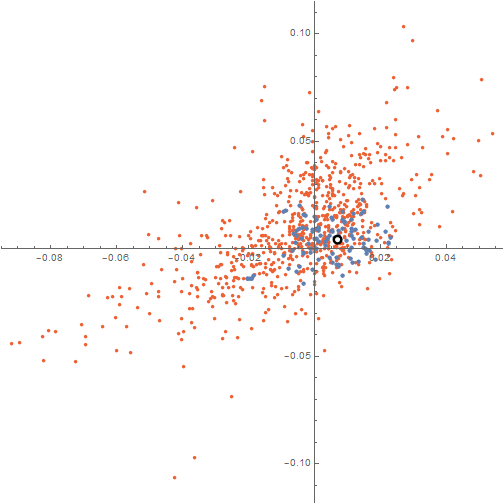 A center of 2018.8 produces a smaller shock of comparable width (a₀ = 0.6 ± 0.1 and b₀ = 0.8 ± 0.2 year). I chose a year + 0.8 because that puts us in October which has a history (actually exactly at October 19th which was the date of 1987's "Black Monday", close to 1929's "Black Tuesday", as well as around the time of the biggest losses of the 2008 recession). The silver lining of a 2018.8 recession would be potential amplification of a "blue wave" in the midterm elections. 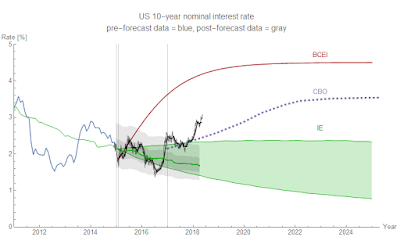 Such a recession would likely also send the interest rate data closer to the model as well. 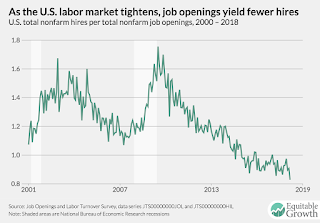 The only signs of a recession (in the information equilibrium framework) are the abnormally high interest rates and the negative deviation in the job openings data. If those evaporate, then so does any evidence of a possible recession. There are other more traditional signs out there as well, such as yield curve inversion. In my macro critique, I mentioned "meta-narratives" — what did I mean by that? Noah Smith has a nice concise description of one of them today in Bloomberg that helps illustrate what I mean: the wage-price spiral. 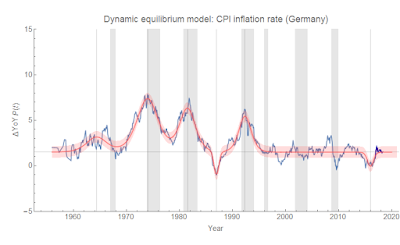 The narrative of the 1960s and 70s was that the government fiscal and monetary policy started pushing unemployment below the "Non-Accelerating Inflation Rate of Unemployment" (NAIRU), causing inflation to explode. The meta-narrative is the wage-price spiral: unemployment that is "too low" causes wages to rise (because of scarce labor), which causes prices to rise (because of scarce goods for all the employed people to buy). In a sense, the meta-narrative is the mechanism behind specific stories (narratives). But given that these stories are often just-so stories, the "mechanism" behind them (despite often being mathematically precise) is frequently a one-off model that doesn't really deserve the moniker "mechanism". That's why I called it a "meta-narrative" (it's the generalization of a just-so story for a specific macro event). Now just because I call them meta-narratives doesn't mean they are wrong. Eventually some meta-narratives become a true models. 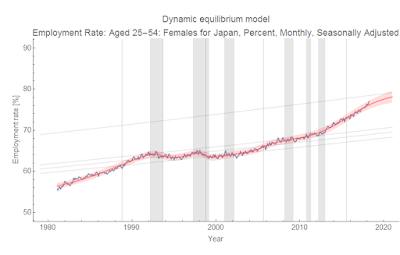 In a sense, the "non-equilibrium shock causality" (i.e macro seismograms) is a meta-narrative I've developed to capture the narrative of women entering the workforce and 70s inflation simultaneously with the lack of inflation today. Below, I will give a (non-exhaustive) list of meta-narratives and example narratives that are instances of them. I will also list some problems with each of them. This is not to say these problems can't be overcome in some way (and usually are via additional just-so story elements). None have yielded a theory that describes macro observables with any degree of empirical accuracy, so that's a common problem I'll just state here at the top. Narrative: e.g. Exploding inflation in the 70s/"stagflation"
The blue line is the data used for the dynamic equilibrium model and the black line was the data available to LtG. 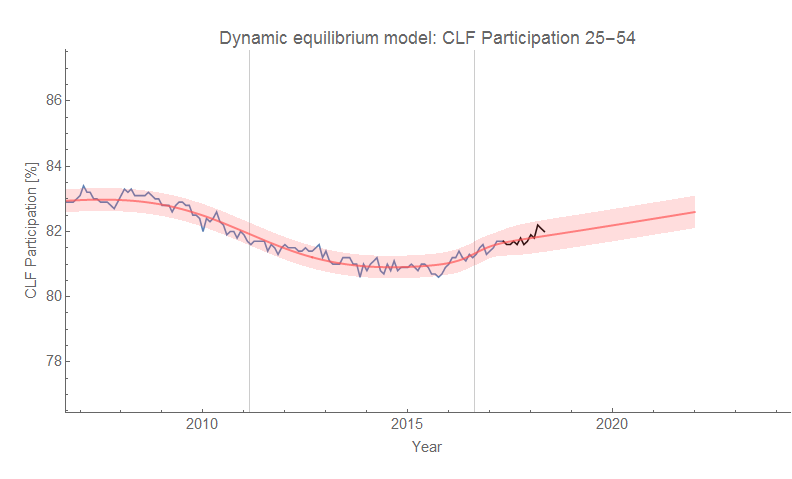 The dynamic equilibrium model is basically consistent with the two LtG scenarios — except for the presence of non-equilibrium shocks centered in 2065 and 2080 with widths of 55 and 24 years respectively. 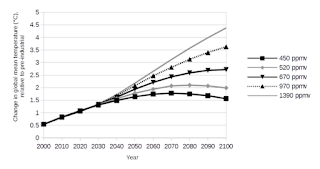 Before 2030, the data is essentially log-linear which means there's a big problem. 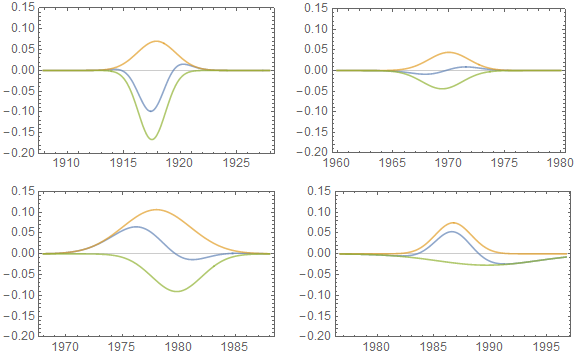 The problem is that that the data required to estimate the future deviations in the LtG model from log-linear growth was not available in the 70s, is not currently available, and won't be available until at least 2030. That is to say we don't have any knowledge of the parameters for the process responsible for those futures. 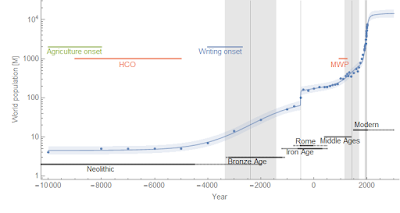 Given we have never observed a human population crash of that magnitude (literally a decline billions of people) happening over those timescales (a few decades), the estimates for the model parameters resulting in those paths are pure speculation . 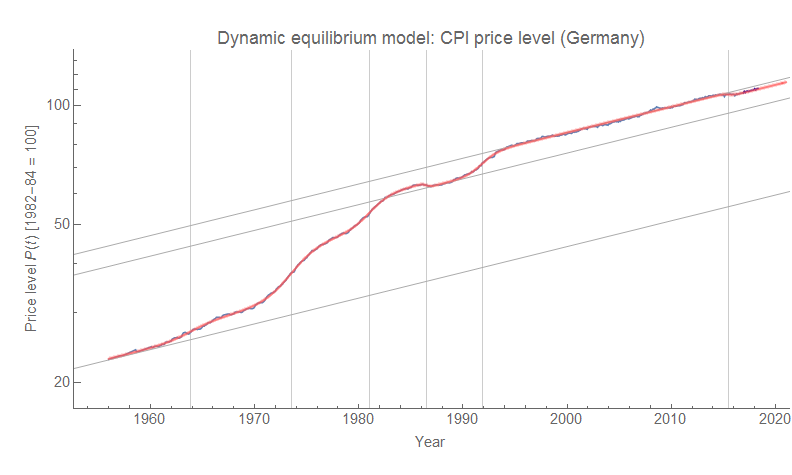 Now you may ask: why doesn't the dynamic equilibrium model also have this problem? As you can see in the top graph of the estimates of human population since the Neolithic, we actually have multiple shocks to validate the approach. 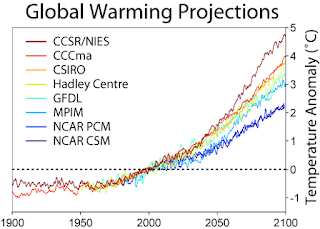 But the more important point is that the latest shock estimated was centered in the 1950s and therefore we have more complete knowledge of it. It's true that estimating the magnitude of an incomplete shock may lead to under- or over-shooting. But the model isn't positing a deviation from log-linearity about which all of the information needed to estimate it lies in the distant future. This isn't to say that the LtG models will be wrong — they could get lucky! The Borg might land and start assimilating the population at a rate of a few million a year (until we develop warp drive in 2063 and begin to fight back) . 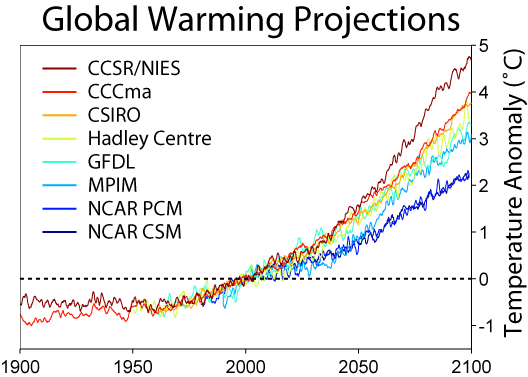 But you should always be skeptical of models that show we are on the verge of a big change in the future . In fact, looking at the shocks I'd surmise that the LtG model just assumes the population in the 1970s was approximately the "carrying capacity" of the Earth so something must get us back there in the long run. I loosely based this scenario on Star Trek: First Contact. The analogy with the LtG model would be if the LtG model just assumed a particular path for birth/death rates (it does not; in fact, it claims to predict them). with logistic functions for the σₐ. 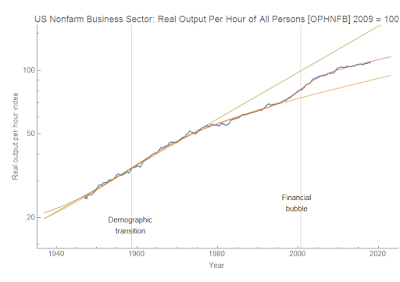 The implicit model of constant growth says just that: productivity growth was constant from the 70s up until the Great Recession — at which point it fell. Nothing affected that growth rate. 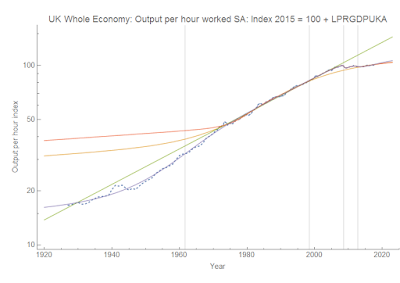 As far as productivity was concerned, nothing happened for forty years. 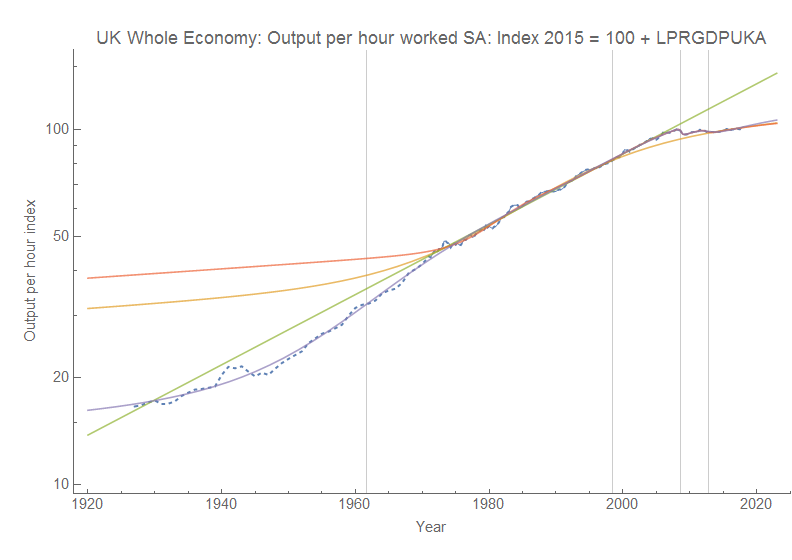 Forty years of an economy just chugging along with a constant rate of improvement. 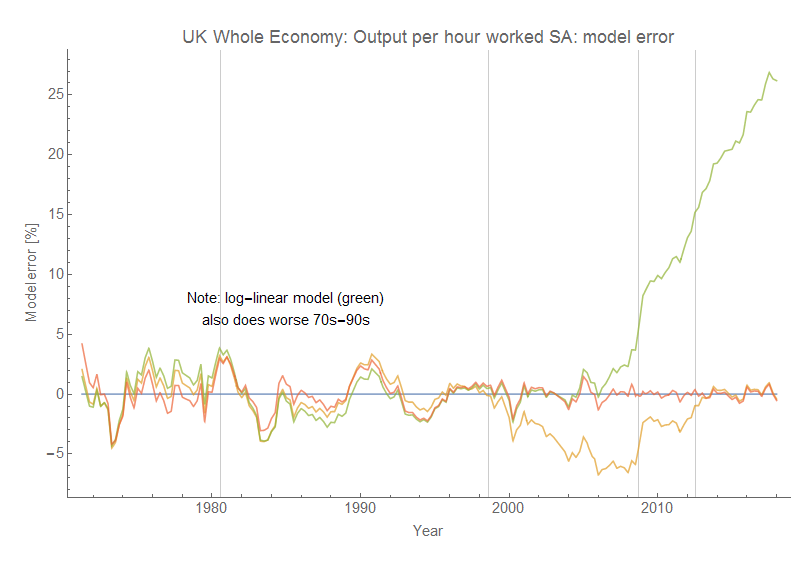 I hope my repetition of the model assumption that nothing changed made you ask: Wait, nothing happened!? 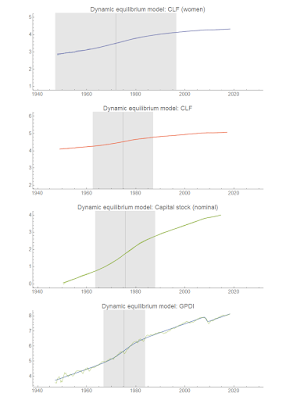 The dynamic equilibrium models take into account that something happened in the 70s and 80s to cause inflation to surge, and growth to be much higher than today (see the analysis at the end of the post here). 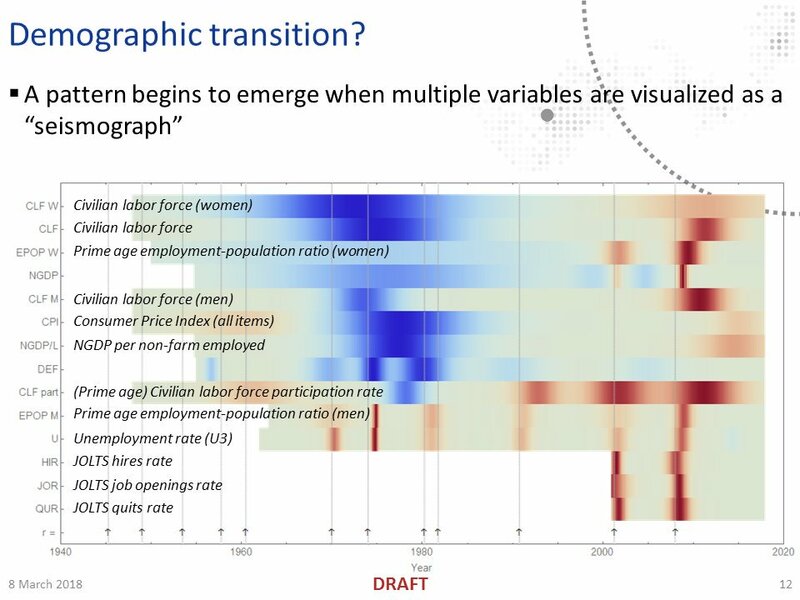 I call it the "demographic transition" where women entered the workforce, but we can be agnostic about the actual cause right now. 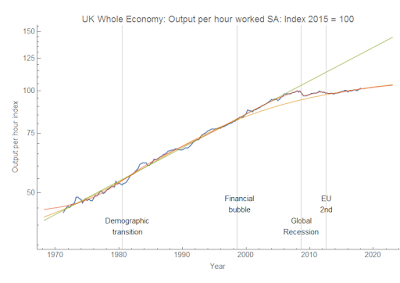 The more complex one notes there was major growth in real estate and the financial industry ("financial bubble") and that the Great Recession actually had an aftershock in the EU which impacted the UK. 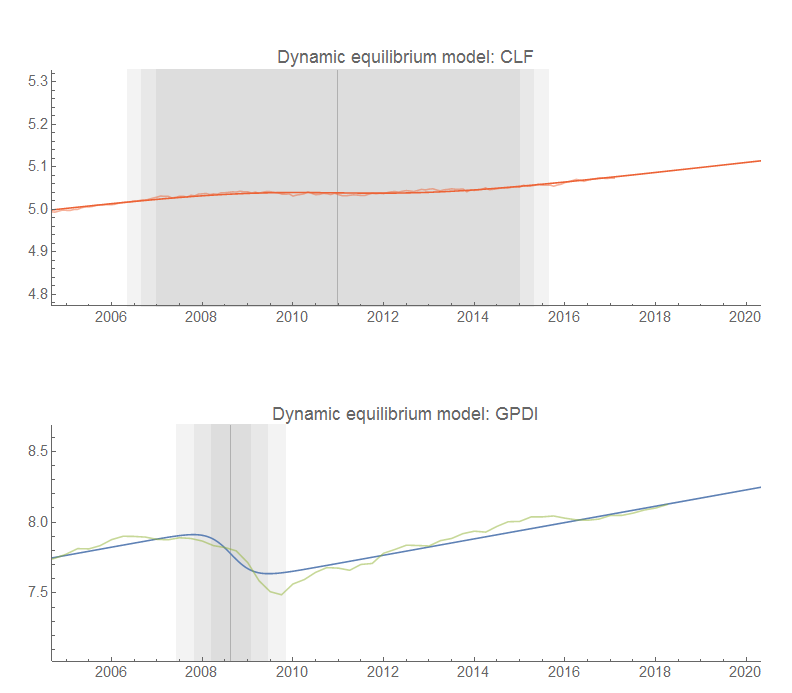 The point here is not just to brag about the dynamic equilibrium model, but to show that interpreting macroeconomic data — even when that interpretation looks as obviously log-linear before 2007 as it does — is difficult and fraught with ambiguities. We should be careful when we think the data "obviously" shows something. 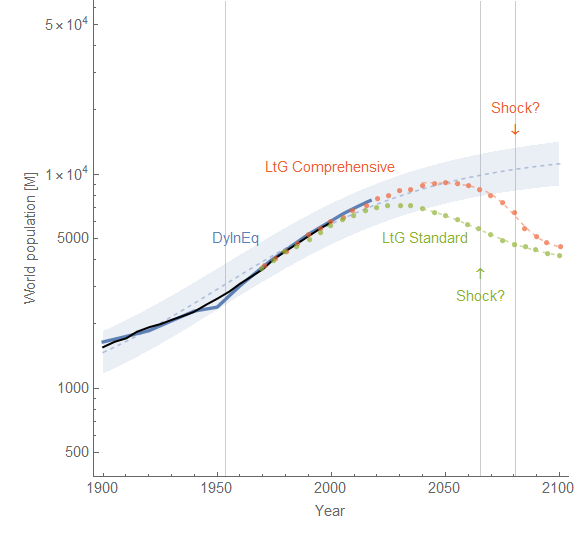 The shock parameter fits typically under- or over-estimate the size of shocks when the data does not contain a bit more than half the shock. 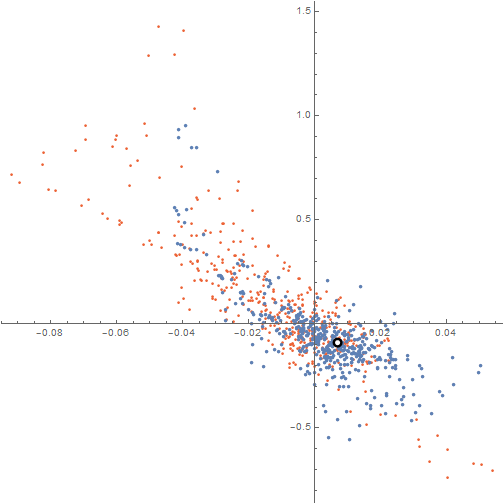 We can see that inverse relationship much clearer now. 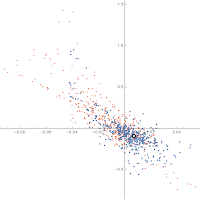 However, we can also see that the inverse relationship has nothing to do with the level, but rather the slope. 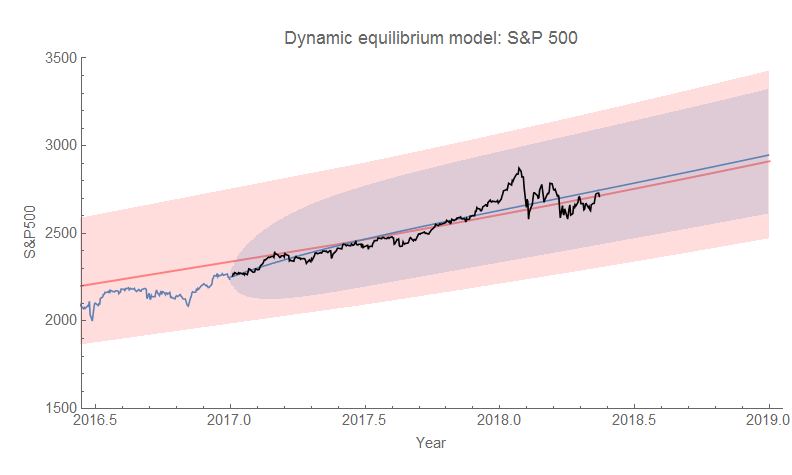 In the dynamic information equilibrium model, it's the logarithmic slope (i.e. log differences). 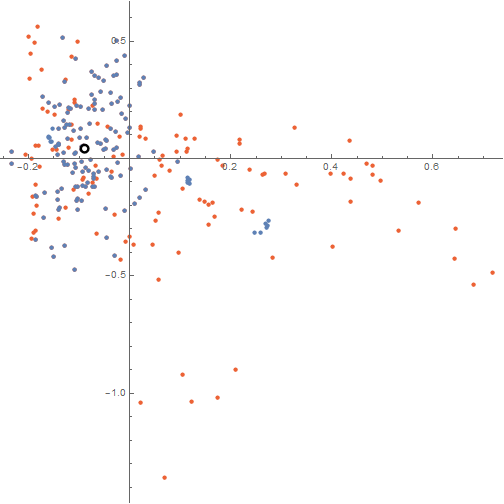 The black and white point is the dynamic equilibrium estimated from the minimum entropy procedure described in my paper. You can see that removing the non-equilibrium periods collapses the data around the dynamic equilibrium point. 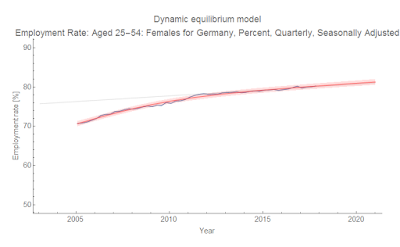 I only used men in these cases because a large segment of the data for women's employment population ratio contains the approximately 40-year period (from 1960-2000) of non-equilibrium demographic shift of women entering the workforce. 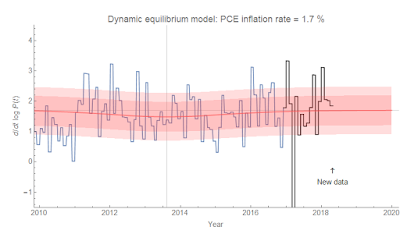 Nick Bunker wrote a Twitter thread on what I could only say is economists dealing with making an inexact meta-narrative square with the data. 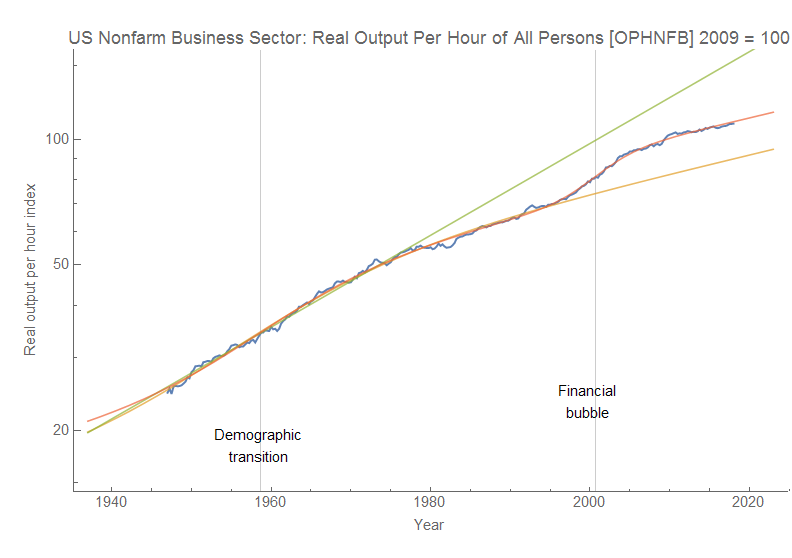 The narrative: the traditional one about inflation, wages, employment, and so-called "slack" in the economy. As employment increases, wages should increase. But the traditional narrative isn't specific about rates and levels, or what the relationship to "slack" is. 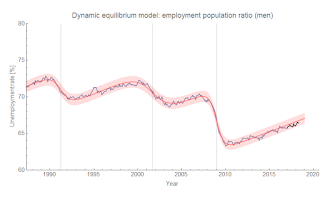 The dynamic equilibrium approach gives us a way to understand the connections (or at least the empirical regularities). 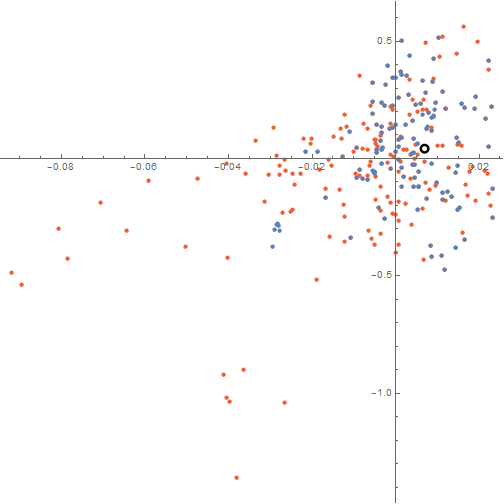 The red and green points represent the center of the shocks to the two measures. 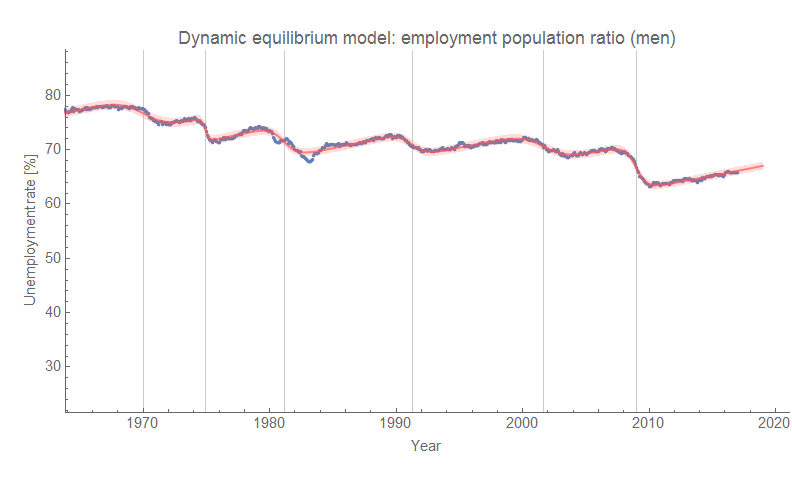 Unlike the more traditional Beveridge curve, the non-equilibrium shocks are more spread out in time making the curves more difficult to see (and therefore why they hadn't been posited to exist). Their "equilibrium" (i.e. 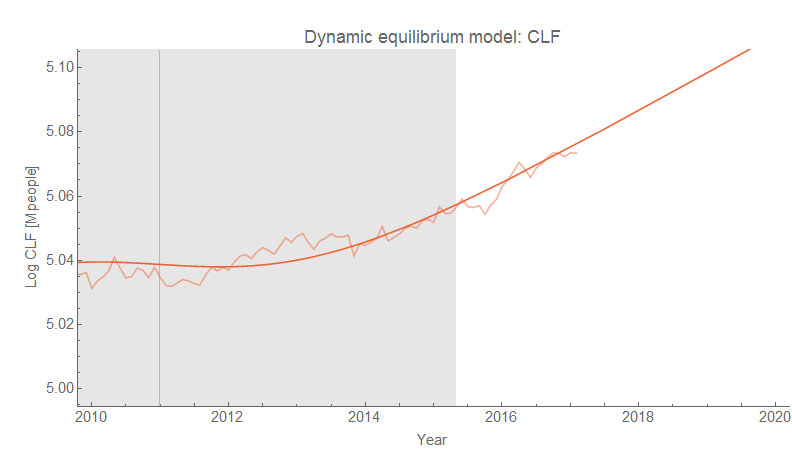 following the curves) values are directly related (rising CLF participation rate is directly proportional to declining unemployment). Note that this also shows a non-equilibrium shock in the post-recession period. 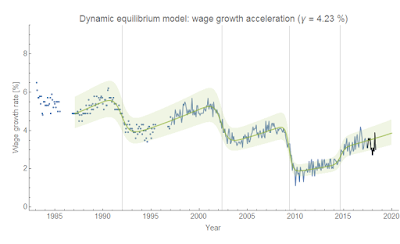 This is a model of dynamic equilibrium in wage growth, not levels, and so represents a constant wage "acceleration" . Click for higher resolution. A general trend appears of 1) a shock to unemployment, 2) a shock to wage growth, followed finally by 3) a shock to CLF participation. 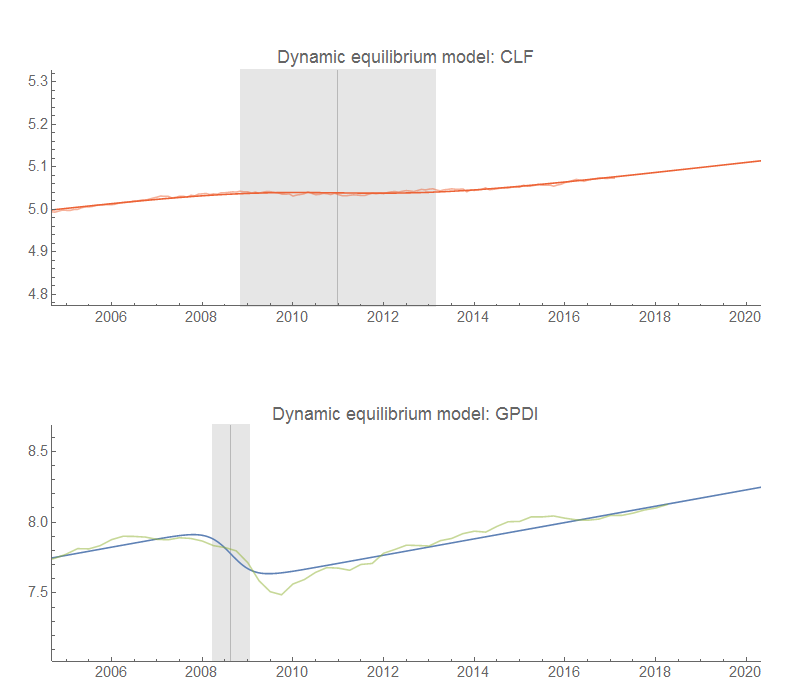 In between shocks there is a direct relationship between falling unemployment, rising wage growth, rising employment-population ratio, and rising CLF participation dynamic equilibria. 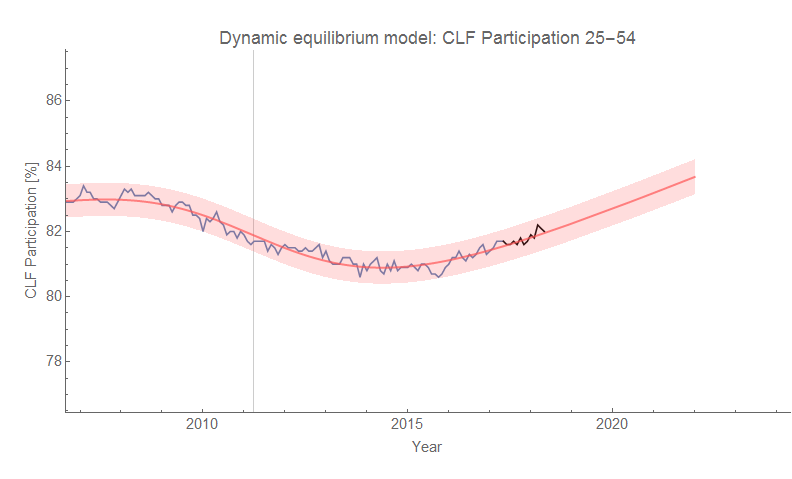 However, the shocks to CLF participation are wide (the red and blue areas on the diagram above) so the limited areas where the variable follows the dynamic equilibrium (gray) make CLF less useful of a measure (it's more often away from equilibrium) — answering one of Bunker's questions. 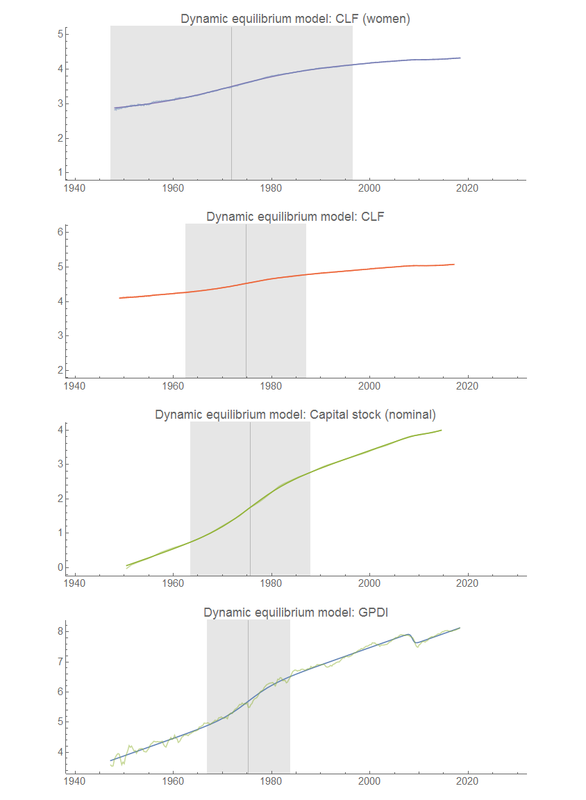 But additionally, these dynamic equilibrium models describe the data well since the 1960s (where it exists) meaning they have a single dynamic equilibrium. There's no empirical backing to the concept of "slack" where wage growth might slow as unemployment or CLF participation reach some value. Unemployment will continue to fall until it rises again due to a recession. Wage growth will continue to rise until that recession happens. Those two things will happen with a 1-to-1 relationship, except where the non-equilibrium shock of recession has a different causal structure in the two time series. Continuously compounded wage growth is (d/dt) log W. Wage "acceleration" is (d/dt) log (d/dt) log W. It is the latter which appears to have a dynamic equilibrium.